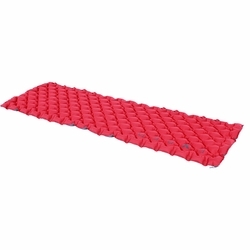 Exped SynCellMat 5 Sleeping Pad. The SynCellMat 5 utilizes a unique matrix of air cells that accommodate body contours and smooth rough ground. Multiple air cells (with microfiber insulation) prevent internal air circulation and enhance insulation. This construction technique also makes the mat compact and light when stowed and ensures rapid inflation. A great choice for hammock camping due to its structural flexibility.